Despite the weather forecast showed a chance of rain in the morning, we kicked off the departing ceremony in the central courtyard of the school. 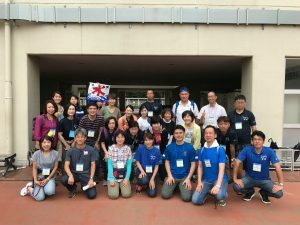 Mr. Kurosawa and Mr. Suzuno both gave a speech saying explaining the purpose of this event for the students, and what they expect the students to learn during this camp. And parent volunteers (below described as　“ma-pa vol.”) gave their self-introductions to the students. 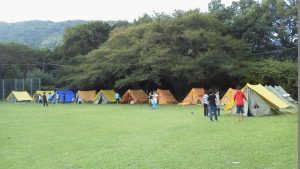 Each team of boys and girls, 6-8 people per team, took the picture then departed towards the camp site on Mt. Tsukuba. 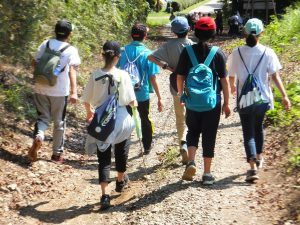 Students had to walk 20 km distance from the school to the camp site carrying all their belongings, each team had to decide their own route to get there by themselves. During that time, there were scattered showers, but it was still comfortable to walk since it was not too sunny or too warm. Some of the ma-pa vol. first had to stand at several places among the 20 km walk, where it was easy to lose the way. This was to keep the student’s safety. Some ma-pa vol. arrived at the camp site earlier to do unpacking, make up the headquarter tents, or post the group numbers on each of the dishes. The kitchenware was divided into each of the team headcounts to help the students complete a smooth and safe work by themselves. Just 2 days were enough to fill up the number of the volunteers this time, the deadline date to apply came so soon and so many parents volunteered that some did not get to join. 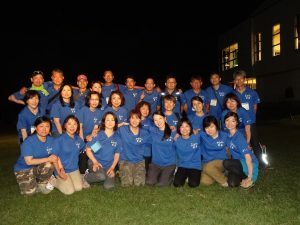 All members of ma-pa vol. 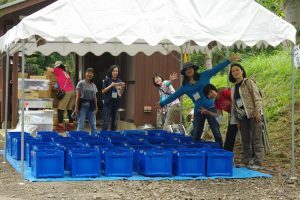 this time were so proactive, half of them experienced the volunteer last year camp in Sashima too. Teamwork of everyone was really strong, knowing well what needed to be done from the beginning. I feel really glad to be a member of such a team and happy to work with them. 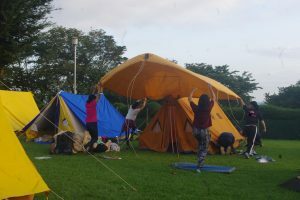 Because of the rain, students stayed slept in the gym the first night, there was no need to make up their tents this day. They could have some leeway. The schedule was fully packed, and hard, so looks like this change made them happy. Thankfully, all the teams completed the 20 km walk and arrived safely. 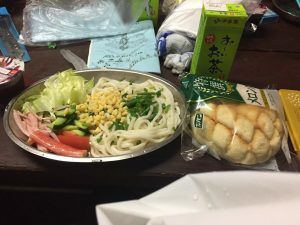 After the camp opening ceremony, they started to prepare their own dinner. Ma-pa vol. were served together with them. This day they didn’t use the fire. Some kitchenware was missing or was moved to a different place, and the eating place was relocated because of the rain. It took some time but they could prepare, eat, and clean up on time. After that, they went back the gym to sleep. We heard from the teachers the next day, they talked and chatted all the time after turning off the lights. They were only quiet just a moment when the teachers came to check on them. They repeated that until midnight. It looks like all the students (although boys and girls were separated) sleeping on the floor would be a treasurable memories for them. The second day started with heavy foggy. Ma-pa vol. started to work from 6:00 AM to make the tea or to prepare the breakfast food delivery. Students, after finishing their morning activities, didn’t seem sleepy at all. They were all very active from the start. 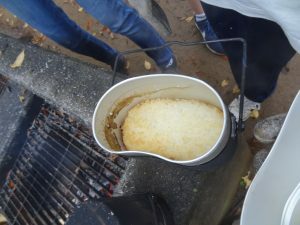 This morning they needed to make two meals, they started to use fire to make breakfast (hotdogs) and lunch (rice-ball lunchbox). 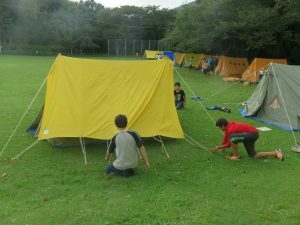 At the camp in Sashima last year, I remember there were so many teams that struggled to make a fire. They could make it finally make it after many tries, but it has been almost one year since then. We couldn’t help them (the teachers told us not to) just watching what they did. Some of the teams took a long time to make it but overall, they had improved from the previous year. They also made the rice balls for lunch for ma-pa vol. 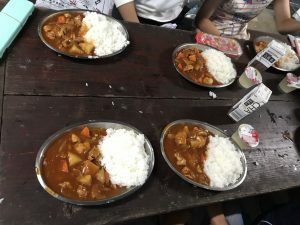 I could find there were so many variations, one team made very big rice balls, others cooked it too long and the rice turned black, and some rice balls were too small. 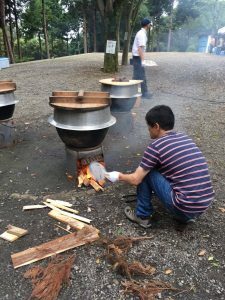 One team, could not make rice balls because of the rice was too hard from the weak fire. 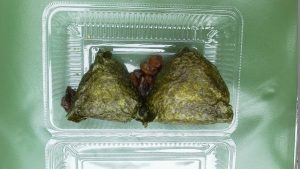 On the other hand, one group could only serve the rice in the plastic pack directly because the rice was too soft. They were happy or unhappy looking at their rice, but they made it by themselves and this made them look independent. Receiving such a lunch from students me feel sweet. They went out for geoscience and geography on-site study. Geoscience study was of the Mt. Tsukuba formation process. They had to climb up the heavy slope some places. They needed to walk longer distance again on this day, but the weather was calm and cloudy. The third day was clear and sunny from the morning! 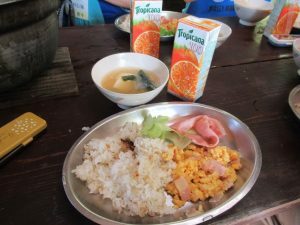 They made two meals: breakfast (rice and miso soup) and lunch (sandwich lunch box) again in the morning. The whole time the cooking progress was really up to each team. All team members working together communicated pretty well with each other, they proceed faster without failure. Although all team members were working, the progress was a little slow. In some cases just girls (or just boys) worked but not boys (girls). However, I could see this time, when I looked those and compared to the last year in Sashima, I thought they were working together much better than last year. There are many different characteristics in students. When spending time and having experience with each　other, they learn a lot and grow up. They will further grow more and more I feel. Orienteering (below described OL) was done when the team went around the points indicated on the map and competed the speed of time toward goal. Each team started at a certain time interval, when waiting for their start time to come, I could feel they were so excited. I was excited to see that. After all, the teams had left, ma-pa vol. practiced the dance which all the teams do at camp fire on that night. The teachers practiced too, I don’t know why but we feel they were our strong rival, so it couldn’t make it worse. Prior to going to the camp, we had a meeting and practiced the dance twice for a few hours each at a community center. We had so much passion, and provided the video to all members to decide the face decoration before coming to camp. After we practiced the dance, we rushed back to each work place. Some members stood in several places to keep the students from not going out into the OL area farther, helped the tea supply points, helped teachers at lunch points, and made tea supply. All the ma-pa vol. members worked very hard to help. I stood at one place to guide students not to be lost. 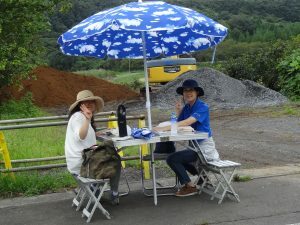 Under the clear blue sky, I placed a camping table and chair on the walkway along to the cross point, we waited for the students to come, and enjoyed talking with other volunteers. When students came, I asked them their OL points status, I enjoyed having such conversations with them. 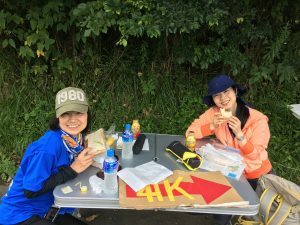 At lunch time, we found the sandwich lunch box made by the students had been nicely warmed by the sunshine. It’s was in really moist good condition and so delicious, I felt so special and had such a fun time. Toward the end of OL, we moved to the goal and waited for each group to show up, after that teams came back minute by minute, the team that came to the goal firsts, looked to be happy. Some students had some conditions such as heat illness, but most of them had recovered after getting rest and it was not so serious. We gave everyone ice candy for an achievement snack. They could rest and have free time before they started making dinner earlier. 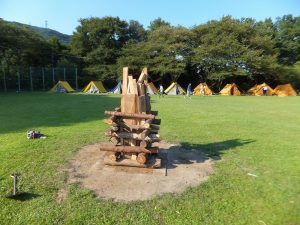 After dinner, the biggest and the long-awaited event of camp, the camp fire, was held. Students did many song dances and practiced to prepare for this. 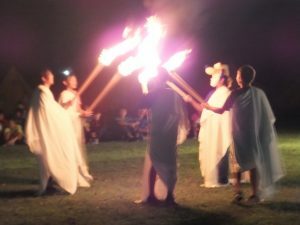 Committee members who worn the white gown turned on the fire to the center fire then camp fire had started. 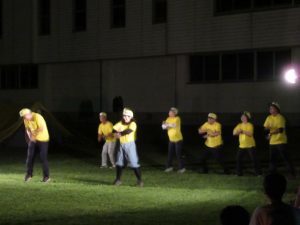 Each class and dance volunteer groups showed their dance or song. I was really surprised each dance and song level were very high and perfect. MC (master of ceremony) was very smooth too. 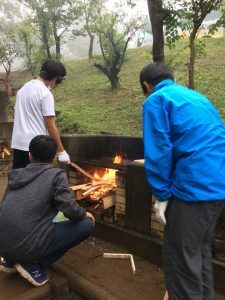 Members were showing on the stage doing their best they could keep enjoying everyone, all students were sitting around the fire, and paid attention to help with warm cheering gently. Teacher’s dance was so excited. Because of many times practice, ma-pa vol. play and dance was done perfectly too. Students cheered us so much. Indeed, I fell all the people did their best and they recognized each other from the heart, did the great work and warm grade of the students. After finishing breakfast, students started to clean up and pack all their things. With the Meikei spirit, we cleaned up the camp much cleaner than when we came. After 3 nights and 4 days camp, everyone was really tired, but the students cleaned up well together. They could make closer relationships with their friends, and made wonderful enjoyable memories. Some had a little bitter experience or other experiences they couldn’t get in daily life. I’m really glad to see how the students matured during this time. 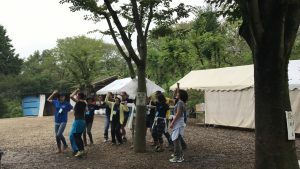 When I joined this camp as a volunteer, I could see what a deep love and passion the teachers have and wish for the students’ growth. I can see and directly feel how the teachers are doing their best all the time to help the students grow up. I feel how happy the students are, and meet with such wonderful teachers. I’m really appreciative to all of the teachers. To all the teachers and volunteers, thank you very much for helping create such a wonderful experience for everyone.